Don Mariutto has contributed to the success of the University of Miami well beyond his days as a student-athlete. A three year starter at right guard, from 1950-1952, Mariutto went on to serve five years on the University Board of Directors as Alumni Representative, as Chairman of the Board's Athletic Advisory Committee and as President of the University of Miami Sports Hall of Fame. Born in Pittsburgh, Pa., Don came to Miami at age 10, he attended Miami High School, where he attained All-City and All-State honors his senior year. 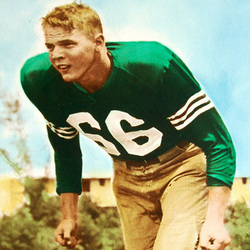 At the University of Miami he started on the 1950 Orange Bowl and 1951 Gator Bowl teams that posted a career 17-4-1 mark and he served as captain of the 1952 squad. Upon graduation he served in the US Air Force on active duty for two years and another 28 years in the reserves, and retire at the rank of Colonel. Don was a member of Iron Arrow, the highest honor attained at the University, a Golden Cane and is a Grand Founder in the Society of University Founders. Don Mariutto bleeds Orange, Green and White for the University of Miami. He passed away in 2012.